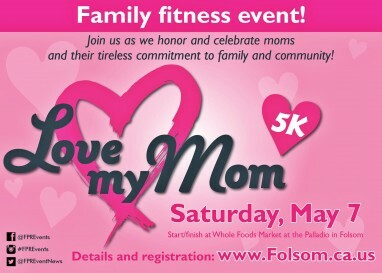 The second annual ‘Love My Mom’ 5K fun run is set for Saturday May 7. Although it is a chip-timed race, it’s more about fitness, fun and honoring mom than it is about competition. 800 to 1000 runners and walkers are expected, doubling the number of participants from last year. The race starts and ends at Whole Foods in the Palladio Center. There will be a finish line expo with refreshments and vendors. Proceeds go to Folsom Arts programs.